Dechra Veterinary Products has announced a new solution for the mass treatment of respiratory disease in pigs. 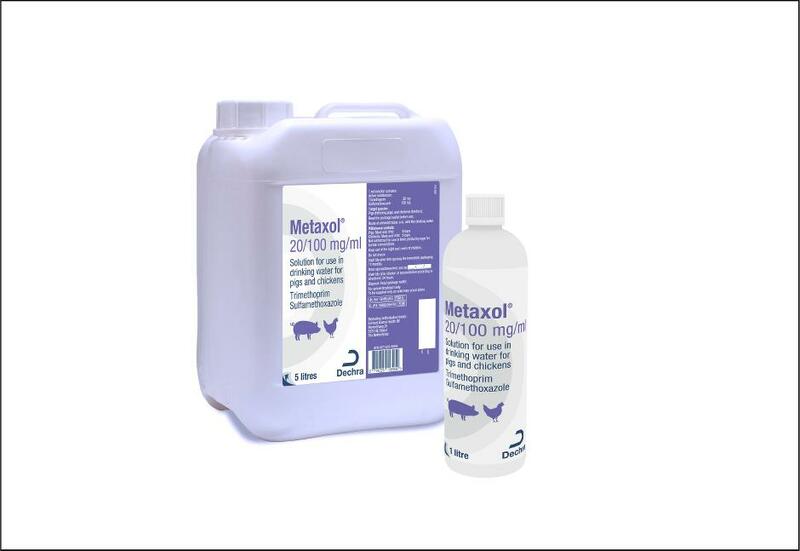 Metaxol, which is part of the firm’s SoluStab range, is replacing Methoxasol and is likely to be welcomed by farmers wanting to target entire flocks thanks to its shorter withdrawal time for broilers. Metaxol contains 20 mg trimethoprim and 100 mg sulfamethoxazole per ml and can be added directly to drinking water or used in a concentrated stock. Dechra Brand Manager Emma Jennings said: “Sulfamethoxazole is a potent sulfonamide and, when combined with trimethoprim, it has a synergistic and bactericidal effect. “Both active ingredients are rapidly absorbed and distributed widely in tissues making it a highly effective treatment. In fattening pigs, it is suitable for the treatment and metaphylaxis of post-weaning diarrhoea caused by beta-haemolytic K88-positive, K99-positive or 987P Escherichia coli strains susceptible to trimethoprim-sulfamethoxazole. It can also be used for secondary bacterial infections caused by Pasteurella multocida, Actinobacillus pleuropneumoniae, Streptococcus spp. and Haemophilus parasuis susceptible to trimethoprim-sulfamethoxazole. In broilers, it can be used for treatment and metaphylaxis of Colibacillosis caused by Escherichia coli susceptible to trimethoprim-sulfamethoxazole or Coryza caused by Avibacterium paraga. The recommended dosage is 0.25 ml of product per kg body weight per day for four to seven days for pigs.